Tahoe Fracture & Orthopedic Medical Clinic — a premier orthopedic center serving Carson City, Nevada — is pleased to offer first-rate scoliosis treatment. Since opening in 1966, we’ve assisted tens of thousands of patients with their orthopedic needs, and we continue to offer unparalleled care using innovative technology and a comprehensive approach to treatment. Scoliosis is characterized by an abnormal curve in the spine, either in a “C” or “S” shape. This condition can affect any area of the spine, but it’s most commonly seen at the chest level and in the lower back. Most scoliosis cases have no known cause, but in some instances, scoliosis is caused by birth defects, spinal injuries or infections, neuromuscular conditions (like cerebral palsy, muscular dystrophy, or spina bifida), or degenerative issues (like arthritis, bone spurs, disc degeneration, or osteoporosis). Many people with this condition notice that their clothes don’t fit or hang the same way that they once did. Scoliosis generally isn’t painful, but in some cases it can cause pain in the neck, back, ribs, and abdomen. In more severe cases, scoliosis can cause the rib cage to press against the heart and lungs, leading to chest pain and shortness of breath. And, adults who had scoliosis when they were children are more likely to experience chronic back pain later in life. What Does Scoliosis Treatment Involve? To diagnose scoliosis, a physician may perform physical and neurological exams, and possibly order X-rays, a CT scan, or an MRI. Treatment will depend on how severe the spinal curvature is and the chances of the curve getting worse with time. In many instances, patients are able to slow the progression of scoliosis by wearing a brace or participating in physical therapy. 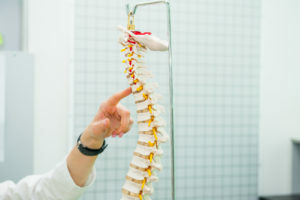 In other cases, a spinal fusion or other type of surgery might be necessary to correct the curve and prevent the spine from curving again in the future. If you’re in the Carson City, NV, area and you’re concerned that you might have scoliosis, call Tahoe Fracture & Orthopedic Medical Clinic today to make an appointment with one of our specialists.